The FJ255 return flight from Fiji last Wednesday 6th June 2018 was a relief for some tired Tennis Samoa players. Player/coach Steffi Carruthers, Leon Soonalole, Marvin Soonalole and Vitikaras Taufao had spent 16 days in Denarau, Nadi, Fiji playing in the Fiji Open from 23 – 27 May and the Nations Cup in Lautoka from 31 May – 5 June 2018. Left behind are two (2) of the playing team Eleanor Schuster and Penina Kamu both in the International Tennis Federation (ITF) Training Academy in Lautoka. Eleanor will be studying and training at the Academy till December and Penina on a summer scholarship till August 2018. 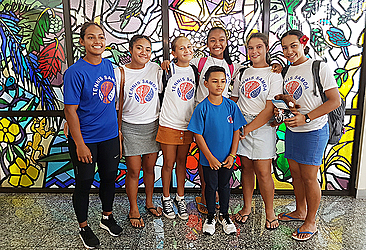 On Monday 28 May 2018, our junior developing players Crystal Christman, Mahina Warren, Roselyn Tupuola, Gloria Meredith and Darius Carruthers returned from the Fiji Open. Samoa was by far the biggest delegation in the Fiji Open with Steffi Carruthers returning to defend her title in the Ladies Open Singles won in 2017. The results made the effort worthwhile placing the players in a realistic position to compete for finals medals in the 2019 Pacific Games. For the 14U Girls, it was an all Samoan finals between Mahina Warren against her compatriot Roselyn Tupuola with Mahina taking out the top honours 6-4 6-4. Gloria Meredith made it to the semi-finals but had to face Mahina who was the number one seed going down 6-1 6-0. Mahina then teamed up with Roselyn, Tennis Samoa’s two top 12 year old girls, to win the Girls 14U doubles 9-1 against a mixed team from Fiji and Japan. This was the start of the highlight for Samoa on finals day. Penina Kamu made it to the finals from a tough and competitive draw of the 16U Girls. Along the way, Penina disposed the #1 seed from Australia Cameron Goss 3-6 6-2 6-0. Penina faced Prudence Bird from the Solomon Islands in the finals who is a student in the ITF Academy. Although Penina came second best this round going down 6-4 6-1, she displayed a level and standard of tennis that warranted an invitation from ITF to attend the ITF Academy in Lautoka for the summer scholarship from June to August 2018. In the prestigious Ladies Open Singles, Samoa was again aiming for an All Samoan finals. However, Eleanor narrowly lost to Fiji’s #1 Ladies champion Mulan Kamoe challenging Mulan the whole way before going down in the decider third set 6-2 5-7 2-6. The other semi finals was played out between Steffi Carruthers and Yaelle Honekoko of New Caledonia. It was a long drawn out match that went to tie breaks in both the first and second sets. Unfortunately, the breaks did not fall Steffi’s way losing both sets to Yaelle 6-7(5) 6-7(5). After bowing out of the Ladies Open Singles semi-finals, Eleanor then turned to the Ladies “A” category finals event where she cruised to win the finals in two sets against Florence Wasko of American Samoa 6-1 6-1. In the Ladies Open Doubles, Eleanor teamed up with Steffi in the finals to play a combined team between Roxanne Clarke of South Africa and Yaelle Honekoko from New Caledonia. Despite their best efforts, the pairing of Yaelle and Roxanne were too strong on the day losing 3-6 4-6. In the Men’s Open Doubles, Leon partnered with Tongan Matavao Fanguna to win the event against Solomon Islands 6-2 6-1. Although our men’s team of Leon and Vitikaras did not feature in the singles finals round, they used the Fiji Open as a warm up for the inaugural Nations Cup immediately following the Fiji Open. In the Mixed Open Doubles, Leon and Steffi lost in the semi-finals to Fiji 2-6 6-1 8-10. The youngest player in the Fiji Open was Darius Carruthers just turned 10 years registered to play in the 14U Boys. Darius won his opening match 6-1 6-2 against Sharma from Fiji but faced tough 14 year old opponents in the progressing rounds. Being his first overseas international representation, we have an exciting future in this young Anglican Primary school student. There were 15 island countries represented in the inaugural team event Nations Cup Pacific 2018: American Samoa, Palau, Solomon Islands, Northern Marianas, Samoa, Tuvalu, Kiribati, Federated States of Micronesia, Vanuatu, Fiji, Tahiti, Norfolk Island, Cook Islands, PNG and Tonga. This was a pilot project funded by ITF for class “C” tennis nations in the Oceania region. The men’s team was made of Leon Soonalole, Marvin Soonalole and Vitikaras Taufao. The ladies team comprised Steffi Carruthers, Eleanor Schuster and Penina Kamu. The ladies team came through unbeaten winning its pool over Fiji and Vanuatu with Steffi and Eleanor each playing singles matches. Penina played the doubles event with Steffi against Fiji and with Eleanor against Vanuatu. In the semi-finals, Samoa disposed of the combined Tuvalu and PNG team with Steffi overcoming Patricia Apisah 6-0 6-2 and Eleanor over Alesi Molotii 6-2 6-3 to set up a finals showdown with Northern Marianas. In the finals, Samoa had a great start with Eleanor disposing of Isabel Heras 6-1 6-3 and needed one more win to take the title. Steffi faced Carol Lee in the second singles finals. Unfortunately, uncharacteristic errors brought Steffi’s winning run to a stop going down 2-6 1-6 to Lee. The tie however activated the decider doubles to play out the overall winner and Samoa’s second chance at winning the title. But they had to contend with an equally competitive opponent in Lee and Heras. Northern Marianas were the better team on the day winning 6-2 6-2 and taking out the title of inaugural Ladies Nations Cup Pacific winners 2018. Despite the finals loss, Samoa showcased its young talent at a high level competition in Eleanor and Penina under the leadership and experience of Steffi Carruthers. Just making it to the finals was an achievement on its own given the lack of competitive tennis team Samoa was exposed to at this level. The results are indicative of the standard that Samoa can produce at the Pacific Games in 2019. In the men’s division, Samoa faced tough pools matches Leon and Marvin overcoming Tonga in their singles but lost to Vanuatu in long drawn out singles matches. They then had to contend with top seed Tahiti in the quarter finals Leon bowing out 6-3 5-7 6-7(5) against Angelo and Marvin 1-6 2-6 against #1 seed Heve Kelly. The score margin is not reflective of the game itself with Marvin throwing everything at his opponent who was 10 years his senior. This was a game that every Samoan would be proud to have witnessed. Having lost the quarter finals, the men’s team had to fight for 5th spot playing Kiribati and Fiji. Leon won over Benjamin 6-3 6-1 and Marvin went three sets to overcome Kiribati #1 men’s seed Bira 3-6 6-4 6-4. Against Fiji, Leon beat Raynal Singh 6-3 6-4 setting up the decider between Marvin and Fiji Men’s #1 seed William O’Connell. William started well winning the first set 6-3. But to Marvin’s determination and will to win, he came back to take the second and third sets 6-1 6-1 cementing Samoa at 5th place out of 15 countries in the inaugural Men’s Nations Cup Pacific 2018 behind Tahiti, Vanuatu, Solomon Islands and Cook Islands. This success would not have been possible without the prayers and support of all TSI members, parents and families. TSI especially acknowledges the sponsorship from Eveni and Siva Afi designs as well as all those persons and employers (Commissioner of Police and Fiti Leung Wai of SSAB) who supported the players in the walkathon as well as their workplaces. TSI further acknowledges the financial support from ITF OTF in air fares, accommodation and meals during the Nations Cup Pacific. TSI also acknowledge Lisa Kamu and cousin Shannon Yam who opened up her beautiful home in Nadi for Team Samoa’s accommodation during the Fiji Open. Finally, we acknowledge all the travelling players especially coach Steffi Carruthers and Assistant coach Vitikaras Taufao who took on the leadership standard bearers of TSI Team Samoa for the Fiji Open and Nations Cup Pacific. To God be the glory, honour and praise.